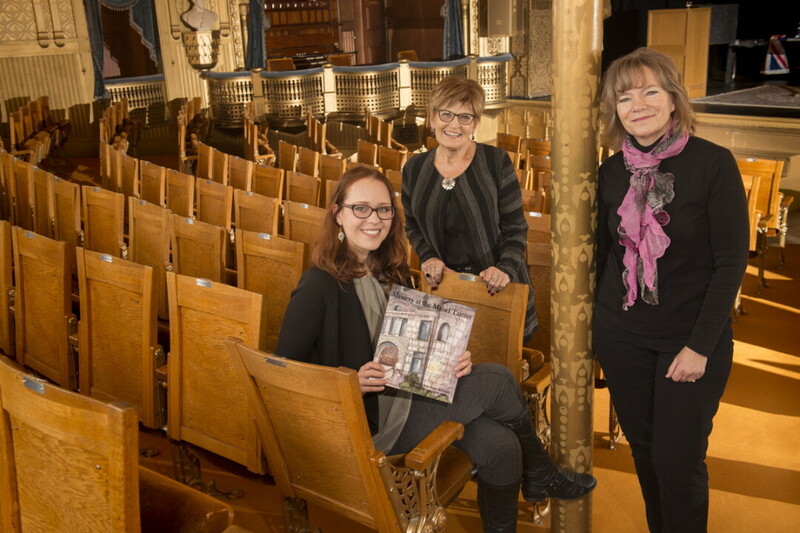 Illustrator Taylor Kysely, board member Judy Foust, and author Mary Heimstead created a book set at the Mabel Tainter Theater. 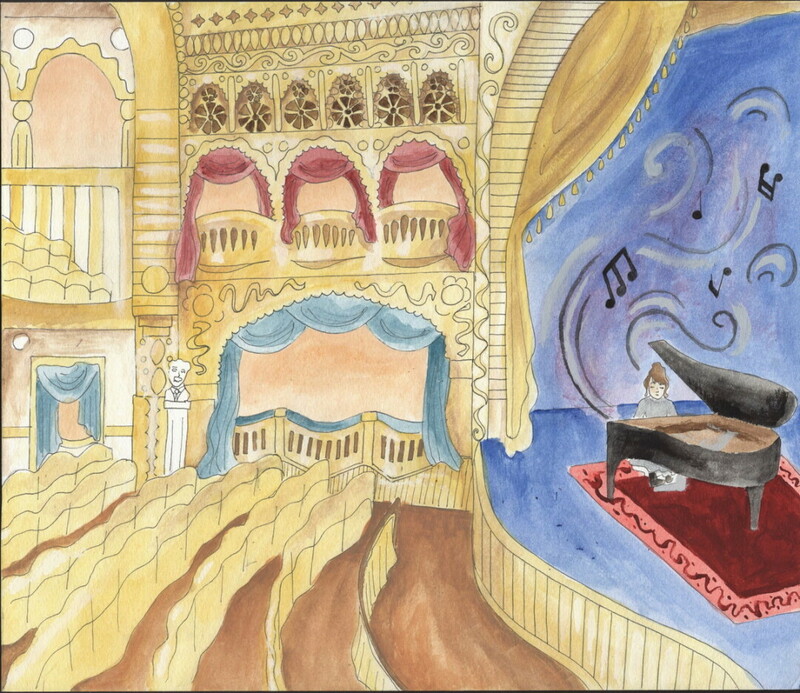 Mystery at the Mabel Tainter, a new children’s book written by local author Mary Heimstead and illustrated by UW-Eau Claire student Taylor Nicole Kysely, explores the history of the landmark Menomonie theater with a paranormal twist. The book, which is geared toward children ages 8 and older, features a pair of twins who are on a tour of the historic arts center. They become separated from their group and encounter a young woman who leads them through the Mabel Tainter while they learn about its history and encounter mystery and apparitions along the way. The book was commissioned by Judy Foust of the Mabel Tainter’s board of directors. “Judy asked for a children’s book, something that could be sold in the center’s gift shop,” Heimstead said. “Given the mystery within the storyline, it seems appropriate for children 8 and older.” She said she learned of the project and the illustrator, Kysely –who previously illustrated a children’s book for Beaver Creek Reserve – through a local author’s group. The arts center was built in 1889 by lumber baron Andrew Tainter to honor the memory of his daughter, Mabel, who died at age 19. The building, which is listed on the National Register of Historic Places, includes a lavish 251-seat Victorian theater. Kysely said that she knew what the main characters, Justin and Janey, looked like the first time she read the story. “I kept bringing in sketches and pages waiting to see what changes Mary and Judy might want, but everything just clicked,” Kysely said. The book has been very well-received. “We just had a book signing and release party and the interest from the community was really fantastic,” Kysely said. “There were so many people with these wonderful stories about their connections to the Mabel and how they want to share it with students or relatives. I think it’s a really inspired idea – to create a children’s book for a historical site, and there seems to be a fairly broad market.” Both Heimstead and Kysely said they are open to future collaboration on projects. To learn more about the Mabel Tainter Center for the Arts – where you can also purchase a copy of the book – visit mabeltainter.org.